For safety, the USDA recommends cooking ground pork patties and ground pork mixtures such as meat loaf to 160°F (70°C). For approximate cooking times for use in meal planning, see the attached chart compiled from various resources. Times are based on starting with pork at refrigerator temperature (40 °F – 4.5 °C). Remember that appliances and outdoor grills can vary in heat. Use a meat thermometer to check for safe cooking and “doneness” of pork. 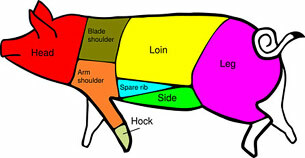 If fresh pork has reached 160 °F (70°C) throughout, it should be safe, even though it may still be pink in the center. The pink color can be due to the cooking method or added ingredients. Set oven at 350 °F (180° C, Gas Mark 4). Roast in a shallow pan, uncovered. Internal temperature: 160° F (70°C) – medium; 170°F (75°C) – well done.